This Sunday Snapshot memory takes up a previous post from around April 2007 that was marked “to be continued”. It was the beginning of what was perhaps to become a book about growing up in the country after the great depression. I don’t know where it will go from here, indeed it may never be finished, but I decided to revive it and continue it until it’s finished or dies a natural death–whichever happens first. One very small (1 pump) gas station, where you could also purchase a few staple grocery items, was the heart of Ellisville in the late 1940s when we moved there around 1947. The nearest town in either direction was Lake City to the north, and High Springs, to the south. Turn east on the hardtop road by Mrs. Leola Witt’s house, just a good hop and skip southward on U.S. 41, and you’ll find yourself in Providence after a few miles through rolling farmland. It was called Branch’s General Store because that was the name of the man who owned it. He’d come from somewhere northward and set up housekeeping in the side of the store with his wife. The store became a daily gathering place. Men like my father would leave their farm chores whenever they could find good reason–maybe to “fetch a part” or gas for the tractor. You could also get nails and hardware displayed in barrel kegs, and while you were there it didn’t hurt to buy a nickel Coca Cola from the ice-cooled case (I remember it was a faded red color and you had to open and close it real fast to keep the cold in) and sit around a spell swapping yarns, discussing the price of hogs and cattle and such. Mrs. Branch had the first Chia statue I ever saw, a head that grew green hair after she faithfully watered it for a couple of weeks. Fascinating stuff for a 5-year-old like me. 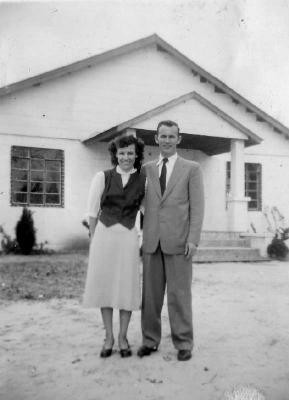 Since I was too young to really know this, I fathom that Margie Bailey was driving north of U.S. 41, fresh out of Bible School in Lakeland, when she noticed that there weren’t many churches located on that long stretch after leaving High Springs. Almost 26 miles with only a church or two scattered in between, and not one holy roller among them! So one fine day when Daddy decided to go fetchin’ in the middle of the day, he saw a huge tent set up in the yard north of Branch’s store. Signs advertised a Revival Night, a date, and an invitation to come and join the fellowship. So one night long after, the family dresses up in Sunday best and goes off to the tent revial to see the woman preacher. There was a guest preacher that night, a boy really, that absolutely charmed everybody, including the five-year-old that was me. Not only could that kid preach with the cadence and rhythm and the best of the best holy roller, he could sing and play the guitar too. I could not have imagined a child with that much influence on grownups. Children in my world were seen and not heard and the parents would be proud to tell you that. And I’d never heard real live entertainment much up to that point in my life. Here we were treated to the best singing and guitar and piano playing one could imagine, some of it fast “boogie” foot stomping style. Sister Margie had a booming voice for such a small woman. When she sang “Mansion Over The Hilltop” and “Something Got A Hold of Me, her voice seemed separate from her diminutive size. Before long, every man, woman and child in Ellisville was in love with her–just as audiences would fall in love with Elmer Gantry nearly 20 years later in the 1960 movie based on a 1926 novel by Sinclair Lewis. Soon she had enough money to refurbish the mechanic’s shed on the south end of the store property, turning it into a tin-roofed church. That tin church was such a hit, and after another revival and a year or two later, after the congregation outgrew it, she built a modern, concrete structure of 5000 or so square feet on a donated 5-acre-tract about a quarter-mile north up the road. It was set back a ways on a dirt road, but still within eyesight of the highway. The church grew and grew. There seemed to be no stopping it. And then one day, a young guest evangelist came to visit. And not long after that Sister Margie Bailey became Sister Margie Patterson. Her new husband looked, to me, like a 5’5″ Roy Rogers in a cream colored suit. They moved into the newly constructed parsonage adjacent to the church and for the next few years would form a gospel singing quartet that included my big brother who sang bass. They sang all around Florida at revivals and guest performances. They were famous–at least locally–through their 15-minute radio program from a local station in Lake City early on Sunday mornings. What I remember best about the church is how terrified I was at the thought of having to “testify” in front the parishioners–which was a very popular thing to do–and how much I looked forward to going into the prayer room in the back every Sunday at the invitational after the service, especially if I saw Edna go back first. You could count on somebody being overtaken by the holy ghost. It was especially satisfying watching Edna writhing on the floor in lowly-lit room because she was so young (probably 18 at the time) and so pretty, and really filled her clothes out in all the right places. Sister Margie would stand prayer over each person kneeling by the prayer benches, one at a time. Sometimes my friend Helen went with me and it was she who taught me what to say when it was my turn with Sister Margie. Usually by the time I’d said three “yes jesuses she would have moved on to the next person and I could open my eyes and watch. Someone in the family I shared my observations with pointed out to me that if I didn’t watch out, one of those Sunday nights the holy ghost was going to get a hold of me and I would be the one writhing around and talking in tongues for the entertainment of the others in the room. Though hidden away in the woods off an obscure country tarmac road, there WAS another church less than 3-miles away to the southeast. Phillipi Baptist. In fact, it was the church my father had more or less abandoned for Sister Margie. She came along during the time he had estranged himself from the Baptist church over a practical joke one of his brothers had pulled on the minister, and the minister had given him the blame. Several years later, Branch’s tiny little general store would succumb to the larger, more modern general store that moved in down the road about 500 feet away, with 4 gas pumps out front to catch the tourist trade down State Highway 441. My uncles store would eventually cause Mr. Branch to close up shop, pack up the missus–no hard feelings–and move away. It was the end or the beginning of an era, depending on how you chose to look at it. This entry was posted in Families, musing, Musings, Personal, Writing by Alice. Bookmark the permalink. Greetings, lovely start to a book! This blog was passed on to me from Eiko Ceremony. We are in the Tuesday Afternoon Red Pencil Society. I am learning about blogging and lovely pages such as yours !!! I will have explore your other writings. Thanks guys! I’ll need every push and shove and encouragement to keep doing this; somehow it seems pointless without somebody or other validating me by being interested in it. I will keep going. Maybe tomorrow!